Long-held debate over the need to widen the punitive damages system here has reignited following cases of BMW sedans catching fire, which have prompted legal action by consumers. The Ministry of Land, Infrastructure and Transport said Tuesday it would aim to add punitive damages under the current automobile management act together with the Fair Trade Commission within the month. “A slew of problems surfaced leading up to BMW’s recall and after the recall was announced, which has led us to review the overall recall system, including the punitive damages system,” the ministry said. The punitive damages system refers to a process of awarding victims financially in amounts that far exceed the proven damage if manufacturers are found to have purposely engaged in an illegal act. According to the ministry, it will set legal grounds for the Korea Automobile Testing & Research Institute within the Korea Transportation Safety Authority to investigate manufacturing flaws at the accident site. Alongside fines currently levied for delayed recalls, measures to fine carmakers that attempt to hide and minimize defects would also be included, the ministry said. The fine would equate to 1 percent of earnings, the same as the penalty for delayed recalls. Earlier, as part of a solution to the prolonged issue related to the exchange and refund of defective vehicles, the ministry had introduced the Korean version of the lemon law last month, to take effect next January. Critics, however, have cast doubts over its effectiveness, calling for stronger measures such as the punitive damages system. Following Oxy Reckitt Benckiser’s toxic humidifier sanitizers that claimed 73 lives here, punitive damages have been introduced in the revised product liability law that took effect this April, compensating up to three times the damage done, but only in the case of major physical harm. It is also applicable for products manufactured after its effectuation on April 19, and manufacturers are not held accountable for faulty products made before the implementation. Under the current law, BMW is not subject to the punitive damages system, as no one was physically affected by the engine fires. “Due to South Korea’s weak legal punishments for companies that knowingly sell defective products, some choose to carry on with sales until the last minute. This is because profit from sales is greater than punishments under Korea’s product liability law,” said lawyer Lee Seung-hwan of the local law firm You&I Partners. Lawmakers have also jumped into the fray of the punitive damages debate. “We will look into implementing the punitive damages system when consumers are affected by a carmaker’s failure to quickly find out the cause and take inadequate follow-up action,” said Rep. Park Soon-ja of the Liberty Korea Party, who is the chairman of the National Assembly‘s Land Infrastructure and Transport Committee. The ministry is also pushing for stricter standards on submitting documents related to recalls, and levying penalties for insufficient documentation. 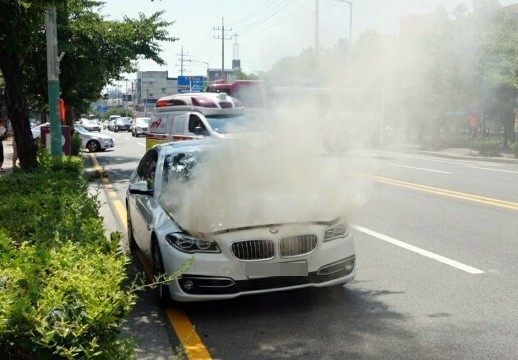 Under the current law, BMW could be slapped a maximum 70 billion won ($62.2 million) fine for failing to issue recalls as soon as the defect was identified in 2016. BMW Korea sold 59,624 units last year and posted earnings of about 3.6 trillion won, according to the company’s figures. Given that 106,000 units have been recalled, BMW could be fined up to 70 billion won if the ministry concludes the carmaker had intentionally delayed the recall.